Pes Cavus or Supinated feet are the exact opposite of the Planus or Pronated feet as the name suggests the foot is like a cave. 1/3 of causes for Cavus feet can be associated with some level of neurological involvement. The majority of focus on research on foot issues is mostly on Planus or flat feet with little research done on Cavus feet despite the fact that people with these types of feet suffer from a greater likelihood of foot pain. The foot takes 3 times your body weight with every step with the load increasing to 6-8 times with running and explosive activity, so having a foot that can share the load is vital. Unfortunately the Cavus foot is generally not flexibile and the load is taken on the ball and heel of the foot which can lead to a multitude of foot issues. 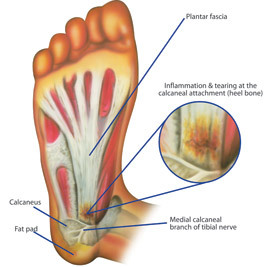 Increased risk of pain corns and callus on the plantar area of the foot. Increased risk of shin and calf pain with weight bearing activity. Increased chance of stress fractures in the foot. Increased issues with knee OA. Increased potential for hip and lower back issues. Iain Maclean, physiotherapist has specifically asked if there is a relationship with Cavus Feet and Plantar Fasciitis (commonly called heel pain, heel spurs etc) unfortunately there is little to nil well sourced and best practice research specifically on this topic. As such the following are my thoughts and are based on anecdotal evidence. Fundamentally the role of the fascia is to assist with the loading of the foot acting like rubber band that runs from the heel to the ball of the foot. The key word is assist, it does not support the foot on its’ own there are muscles within the foot and muscles running down from the lower leg that are the key supports of the feet. The reasons for the occurrence of fasciitis or plantar heel pain are many and I will present a blog on this topic at a later date. Suffice to say the fascia becomes overloaded and is unable to heal due to the constant load being placed on it. Patients talk about pain upon rising in the am, like a stone bruise, which eases once they warm up but worse as the day goes on. Because of the nature of fasciitis, structures around the problem need to increase their load taking/redistribution while the fascia heals. This is difficult for the muscles to do as with this problem the obvious thing is to walk on the ball of your foot to avoid loading the heel. This leads to tightening of the Achilles which in turn places prolonged loading on the fascia slip which shares fibres with the Achilles. This is a problem in a normal foot but in a Cavus foot the Achilles is already tight so increasing the tightness has a direct impact on the recovery of fascia. Application of supportive strapping to the foot. Avoid bare foot walking for women a 2.5 cm heel is ideal while for men boots eg RM style boots. Massage therapy for the calf muscles. Ice therapy directly to the foot – get a plastic round bottle partially filled with water and freeze and roll it on the base of the foot and gentle roll along the foot. Usually some form of in-shoe support made for the patients foot – orthotics (to be discussed in later posts). If you or someone in your family has a high arched/cavus foot type it is certainly worthwhile having the foot reviewed by a podiatrist at Absolute Podiatry to ensure long last damage does not occur to the feet.